Adam Prudent and Joy Ride. Lexington, KY – July 28, 2015 – If their performances on Tuesday are any indication, Adam Prudent and the team at Plain Bay Sales are in for a great week at the Kentucky Summer Classic. The show got underway on Tuesday morning at the Kentucky Horse Park, and Prudent and student Madeleine Stover kicked things off by earning back-to-back victories in the largest jumper classes of the day. Prudent’s win of the day came in the $5,000 1.40m Open Jumpers aboard IAG Syndicate LLC’s Joy Ride. Prudent and Joy Ride were one of six to go clear over the Florencio Hernandez designed course, but their time of 69.567 seconds is what would clinch them the victory in the Table II, Sec. 1 speed class. While no one else was able to break below the 70-second mark, Denise Wilson came the closest. She finished in both second and third, taking second on Nimbus, who finished clear in a time of 70.550 seconds, and third on Catuso, who finished clear in a time of 74.857 seconds. Joy Ride has recently been competing to much success in the 1.30m to 1.35m divisions, but the mare made the move up seamlessly to the 1.40m today. Also making a move up the heights this week were Madeleine Stover and Royal Des Etisse. Stover has been a student of the Prudents for approximately 10 months, and has been seeing great success aboard Royal Des Etisses, a 10-year-old Sell Francais gelding, owned by Chester Ridge LLC. Tuesday was no exception, as the pair produced a double clear effort to win the day’s 1.35m Open Jumpers in a jump-off time of 48.336 seconds. Stover was one of four riders to complete the first round without fault and one of only two to produce a double clear effort. The second double clear and the second place ribbon went Callie Schott and Lori Custer’s Paratrooper, who finished on a jump-off time of 52.277 seconds. Rounding out the top three were Sharn Wordley and Gran Canyon, owned by Ashland Stables. Jumper competition continues on Wednesday in the Rolex Stadium at the Kentucky Horse Park beginning at 8 a.m. with $5,000 1.40m Open Jumpers. 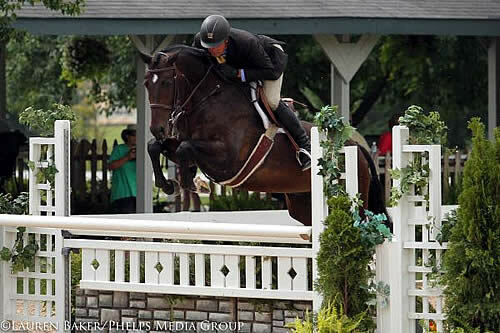 Jumper highlights during the Kentucky Summer Classic include the $25,000 Hagyard Lexington Classic at 7 p.m. on Thursday and the $50,000 Kentucky Summer Grand Prix sponsored by GGT Footing on Saturday night. During last week’s Kentucky Summer Horse Show, Tim Goguen consistently conquered the top spots in the professional hunter divisions with his trio of dark bay geldings: Rookie, Capella and Ransom. The proven combinations returned this week, duplicating their winning ways at the Kentucky Summer Classic. In the First Year Green Hunters, Goguen piloted last week’s reserve champion, Garland Alban’s Capella, to blue ribbons in both over-fences classes, coming in second to Belhaven Stables LLC’s Rookie in the under saddle. In addition to winning the hack, last week’s champion, Rookie, picked up two second-place ribbons over fences. As the day continued with the Conformation Hunters, it was Robert Crandall and Casallo who swept the field, claiming all three of the division’s blue ribbons. Last week’s champions, Winn Alden and Covert, followed closely behind and placed second to Crandall in both over-fences classes. Crandall and Casallo are old friends whose relationship dates back to Crandall importing the now-11-year-old Casallo as a 3-year-old stallion from Europe. The pair was recently reunited after Casallo’s current owner, Erin McGuire, put the gelding up for sale as she heads to college. Crandall jumped at the opportunity to lease the gelding for the year: an arrangement both parties are thrilled with. The Second Year Green Hunters were the next to show, with last week’s reserve champions, Goguen and Ransom, coming back to earn the top spot in all three classes. The division’s reserve championship is in question, however, as second place went to a different horse-and-rider combination in each class: once to Just D’o, once to Covert and once to Fusagers Carma. The professional hunters conclude on Wednesday with the awarding of the division champions and the week’s overall grand hunter championship, sponsored by Visse Wedell at Douglas Elliman.